Ubuntu is one of the most popular Linux distributions – if not the most popular! Just Google “how to install Ubuntu” and you will find lots of tutorials. Still, some of them miss crucial details, so here’s my take, which will (hopefully) cover all the gaps. 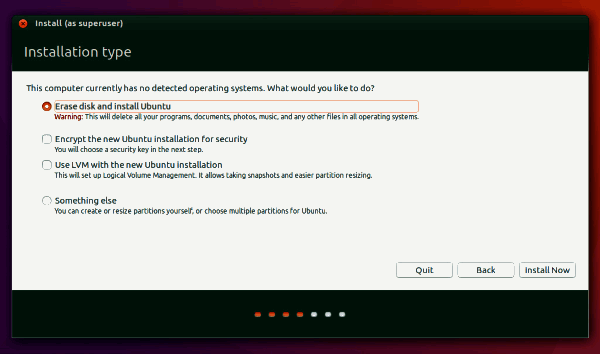 Begin by deciding how you want to install Ubuntu. Will you use a DVD version of the installation kit? Or will you rather go for a USB memory? Or maybe you want to simply run Ubuntu from a memory stick, and decide if you want to install it on your computer later. No matter what path you choose, the process is very similar. It all begins with downloading the installation kit from the official website – an ISO image file. Then, burn the image to a DVD using Windows’ built-in tool, or go for a freeware third-party ISO burner such as ImgBurn. Now that you’ve got an Ubuntu installation DVD or memory stick, restart your computer. If the BIOS is set up to allow your computer to boot from the DVD, the installation process should begin right away. However, if this doesn’t happen, restart the computer one more time, and then get into BIOS by pressing the either the “Delete” or the “F2” key. It is wise to check your computer’s manual; depending on its manufacturer, you may need to press a different key – and sometimes even a key combination – to access the BIOS. Here is WikiHow’s article that shows a few methods to get into BIOS. Once you are inside the BIOS menu, enable DVD booting, and then set the DVD as your first booting device. Sure, you should do that for the USB drive, in case that you plan to install Ubuntu using a memory stick. Save the options and exit the BIOS menu; your computer will restart once again, and then you should see Ubuntu’s welcome menu. 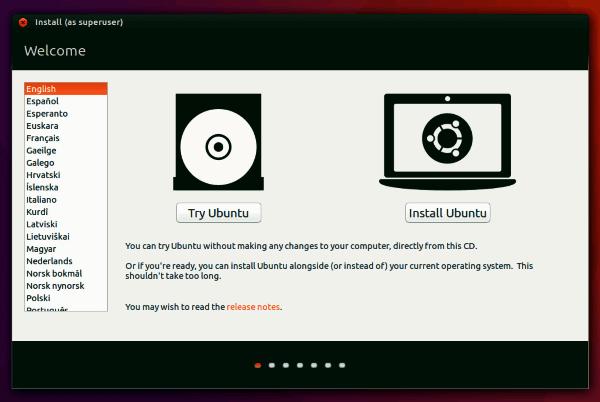 Here you will have the option of either trying Ubuntu, or installing it on your computer. You can also choose the installation language from this screen. If you are using a laptop, it is wise to plug it into a power source; otherwise, you will risk losing your data in case that the laptop runs out of battery power (and is forced to shut down) during the installation. Another key thing is to make sure that you’ve got enough disk space on your computer. For best results, ensure that you’ve got at least 10 GB available. An Internet connection is also helpful. Plug an Ethernet cable into your computer, if possible; this way, Ubuntu will be able to download and install the newest updates and third party software that may be useful for you. The good news is that Ubuntu’s installation kit also works with wireless networks, so if you don’t have Internet access, you can take your laptop to a nearby coffee shop which provides free Wi-Fi and install it there. The installation process can now begin. You can either install Ubuntu and preserve the existing operating system, or you can you erase the entire disk and install Ubuntu instead. 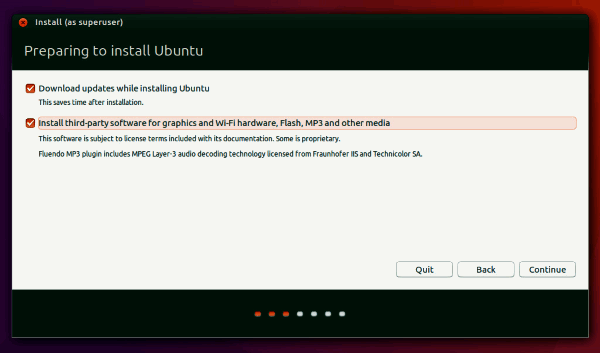 Each Ubuntu installation kit has a different size, of course. But just to give you an idea, Ubuntu 16, the current O.S. version at the moment, needs about 5 GB of free space. And with other third-party software and applications that you may want to install, you can easily reach the 10 GB mentioned above. It’s time to choose your time zone. Often times, Ubuntu will detect your location based on your IP address. If you aren’t connected to the Internet, you can specify your location manually, of course. Choose the desired keyboard layout. Then, enter your username and password. It’s time to let Ubuntu do its thing. You will be prompted to restart the computer at the end of the process. That is all! Trust me, the process used to be much more complicated a few years ago, when I installed Ubuntu on one of my ancient computers. Fortunately, it’s all very easy now!